As fighter jets screamed through the sky and nationalist songs blared, leaders made speeches and people took advantage of free rides on trains and buses. While marveling at the island's leap from a poor colonial port to a wealthy metropolis, Singaporeans are also grappling with a growing resentment over political restrictions, an influx of foreign labor and a rising cost of living. "This is a milestone. 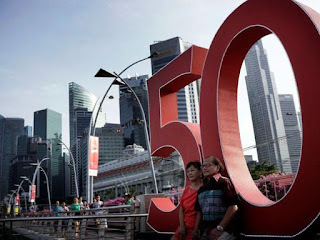 Coming from an older generation that has seen Singapore through the early years of independence, I know it took hard work by our leaders to get here," said William Nathan, 70. The weekend of celebrations culminates with fireworks after a military parade on Sunday. The sense of unity and pride in Singapore's achievements was reinforced with a tribute video dedicated to its founder and longest-serving leader, Lee Kuan Yew, who died in March at age 91, after running a virtually one-party state. Lee, who was prime minister for more than three decades, had no tolerance for political dissent. Opposition figures were either defeated in elections or taken to court on defamation charges until they were bankrupt. The country's laws prohibit bankrupts from contesting elections. His son, current Prime Minister Lee Hsien Loong, is now steering Singapore with similar restrictions, and is facing a general election expected to be held Sept. 12. The ruling People's Action Party, which holds 80 of 87 parliamentary seats, suffered its worst results in 2011 elections. Reporters Without Borders' 2015 World Press Freedom Index ranked Singapore 153rd of 180 countries, below Gambia and the Democratic Republic of Congo. The government's recent moves to take a teenage blogger to court and require popular news sites to obtain licenses were met with outrage from the online community. But there were no street protests — demonstrations in Singapore can be held only in a designated area, the 0.97-hectare (2.4-acre) Hong Lim Park. All other gatherings require a police permit. "Robbing Singaporeans of freedom is like killing part of the nation's soul at any time. Is there a price on stealing a soul?" said senior research associate Bridget Welsh of National Taiwan University's Center for East Asia Democratic Studies. "Singaporeans would have made more progress if there had been more freedom, more ideas, more voices to address the country's challenges," she said. When the population boomed to over 2 million in the 1970s from 1.89 million at independence, Lee vigorously campaigned for women to stop at two children - fearing it would impede economic growth. He also carved a place for a second language in the English-medium education system to make Singaporeans more marketable. "We want the government to know that we are not happy, and you can't push everything down our throats. Peaceful protests are a legal platform for Singaporeans to voice out," said organizer Gilbert Goh, who has since held several smaller rallies.